Although Ford Trucks are already our top-selling vehicles here at Waldorf Ford, Ford Truck Month adds to the excitement! With a massive inventory containing hundreds of Ford Trucks, Waldorf Ford is your go-to destination for your next truck, whether it’s for work or for play. Whether you’re in the market, or are thinking of purchasing a new truck in the next few months, now is a great time to buy. Through April 30, take advantage of our Liquidation Sale. With brand-new trucks starting as low as $16,990, you’ll love your new truck, and the price that comes with it! If it’s a pre-owned truck that you’re seeking, we’ve got plenty of options for that, as well! View our Pre-Owned Inventory, and take advantage of the savings you’ll receive, just for purchasing pre-owned. So, what are you waiting for? Take advantage of our lowest prices of the season! Contact us today to learn more! Numerous safety awards. Unprecedented durability. Advanced technology features. It’s no wonder the F-150 continues to be named the best-selling vehicle in America. Learn about the innovative features for the new Ford F-150 below and then schedule a F-150 test drive today at Waldorf Ford near Alexandria and Clinton! With more safety features than the RAM 1500, Nissan Titan, GMC Sierra 1500, and Chevrolet Silverado, the new F-150 earned the NHTSA 5-Star Safety Rating and is an IIHS Top Safety Pick, making it the safest pickup truck in the market. Revolutionary safety features weren’t enough for the F-150 engineers – 12,000lbs of towing power, best-in-class payload, 360-degree camera with split-view display, and a LCD productivity screen with Bluetooth capabilities are just a few more of the new F-150 capabilities. Designed to combine safety, power, and comfort behind the wheel, the 2017 F-150 is truly unstoppable. for delivering the strongest and highest levels of customer satisfaction. Whether you’re looking for a new F-150 or a pre-owned Raptor, visit our Ford dealership near Alexandria today to experience quality customer service while finding your perfect pickup! Learn More and Test-Drive the 2017 F-150 at Waldorf Ford today! For the last few months all I’ve been hearing about is the 2015 Ford F-150 and today I got the chance to test drive one. First off, believe everything you read by the automotive critics when they tell you that this truck is going to be the hottest truck of the year! I’m a truck guy, I’ve been driving an F-series truck since the age of 16, so I’m going to be it’s biggest critic. The first thing I did was walk around the truck to inspect the body lines, feel the new aluminum body, and jump up in the bed. Ford did a fantastic job with this aggressive looking front end. To me it’s a more manly look the way the hood lines flow into the chrome horseshoe shaped grill. Notice the fog lights, last year we had circular fog lights, this year Ford squared them up to compliment the rest of the edges on the front end. When I got to the back of the truck I opened up the tailgate. As a matter of fact I opened the tailgate about three times because I couldn’t believe how light it was! And don’t get it twisted, it wasn’t light in a poor quality way but light in a performance perspective. The tailgate was thick too, unlike a lot of other tailgates I’ve opened. Everything felt secure on the back end, and looked really well. You can see in this photo how well that body line about 6 inches down from the top wraps around the bed of the F-150 across the taillights and onto the tailgate. So from here I was eager to see the interior so I jumped on in with no hesitation. Immediately I noticed the new dash that Ford has created. That rectangle – horseshoe look that we saw on the front end is replicated into the dash using the chrome outlined air vents, and SYNC entertainment system. Attention to detail is important, and Ford executed the appearance of this F-150 really well. Though it’s only a minor component to this masterpiece, the power outlets on the dash of the ’15 Ford F-150 meet the needs of all consumers. From your traditional cigarette lighter socket, to a 110-V household power socket, to USB, this blue oval beast can charge about everything. My next highlight is going to be the space in this 2015 F-150, which for me hasn’t been a problem because the more recent F-150’s have always had plenty of room. But what I’m so excited about is the extra width of this truck. I first noticed this when I sat in the back seat of the truck. I’m 6ft. 1in. and this was my position in the backseat with the driver’s seat fitted to another 6ft. person. A lot of room right? And not only room in front of me, but room to the side as well! I felt like 3 large adults could sit comfortably next to each other with out breaking into ones’ personal space. Fellas have you ever rode in a truck with your buddy or co-worker and kept bumping elbows because the arm rest was just too narrow? Awkward, I know! You won’t have this problem in the 2015 F-150 unless of course you and your passenger are built like the Incredible Hulk. Ford used it’s extra cab width right by making more room in the middle for arms, or perhaps another person. Now, the best part of this whole first experience was putting this tough monster on the highway! As soon as I let the break out, and turned out of the parking spot I could tell that the truck drove smooth. The steering wheel felt right, everything rolled like I was floating on a magic carpet. For a minute there I forgot I was driving a truck. Then, as I entered onto the highway I put the pedal to the metal to see what this bad boy had in it. Wow! That 3.5L Ecoboost V6 had my jaw on the floor, and the wheels turning. I couldn’t believe there was just 6 cylinders to this machine and not eight. I’ve had a V8 in all of my trucks, but to be honest, none of them really gave me the thrill that the ’15 just did. From the acceleration, to the breaking, and turning the ’15 Ford F-150 had me wishing I could drive this every day. So now you know my thoughts on the highly anticipated 2015 Ford F-150 at first glance. It’s your turn to come into Waldorf Ford and experience the thrill of the 2015 truck of the year. 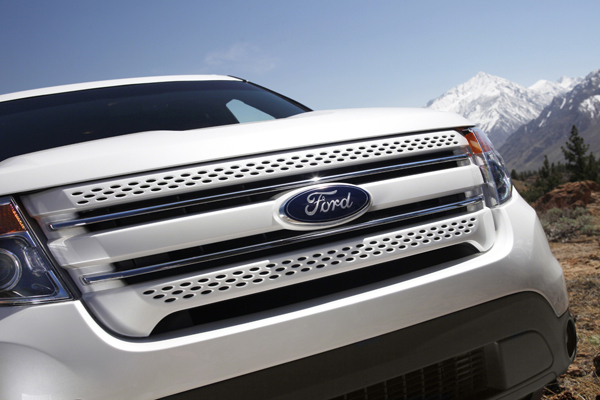 Help us “break the Internet” by sharing your Waldorf Ford experience! Whether you are purchasing a new vehicle, stopping in for service, adding something new to your ride, or just coming to visit:) be sure to use the hashtag ‪#‎ILoveWaldorfFord‬ on your social media network. In addition to our social media campaign, Ford is changing some of the wording on their customer surveys, so we thought we would create a photo opportunity for our customers that went along with the survey. Some of our employees wanted to test it out…here is the result. Waldorf Ford is located at 2440 Crain Highway in Waldorf, MD 20601! Visit us online at http://www.waldorfford.com or call 301-843-2400! Brand promoter – are you one? Yesterday, when I was out and about in a 2013 Explorer, I happened to stop at a local grocery store to pickup some things. As I was walking into the grocery store a woman I didn’t know stopped me to ask how I liked my Explorer. Have you ever had this happen? Seems like I am always being asked about whatever vehicle I am driving – whether it is an Explorer, Edge, Fusion or Super Duty. My answers are always honest about what I like and don’t like, but they do always end up promoting what I am driving. I guess its because I won’t drive it if I don’t like it….but that is probably the case with most of us. So what did I tell her you ask? Well simply that I really liked the Explorer. It handles well, is roomy and gets decent gas mileage for it’s size. I encouraged her to take it for a test drive at a local event sponsored by our dealership. Hopefully she will and we can add another promoter to the Ford family.